Holiday Inn Rock Island is a full service hotel, with Bennigan's Irish American Grille & Tavern, serving breakfast, lunch, dinner and room service. Located in the vibrant Downtown Rock Island Arts & Entertainment District, along the banks of the Mississippi River, with art galleries, restaurants, brew pubs, nightclubs, comedy club, professional dinner theatre, antiques and unique shops. 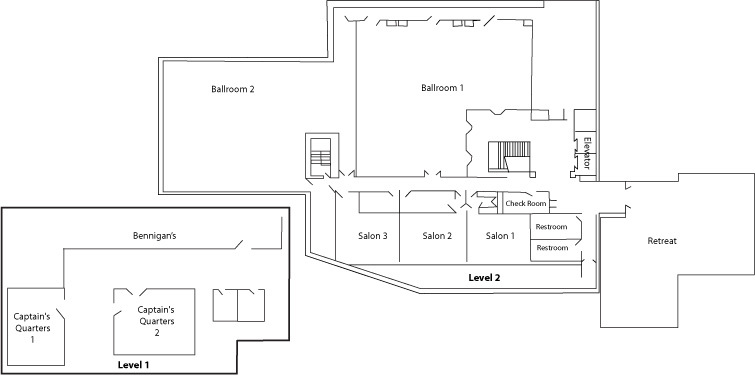 The perfect convention location, over 9,000 sq. ft. of flexible meeting space, available with full high speed internet. Our elegant ballroom, with crystal chandeliers and mirrored arches, along with our professional banquet staff, provide the ideal setting for your wedding and other social events. Each of our 175 guest rooms and 3 suites offer voicemail, in-room safes, data ports with internet access, cordless 2-line phones, electronic door locks, coffee brewers, irons, ironing boards, and hair dryers. Our Executive levels are secured access floors, offering upgraded amenities for our more private guests. We also recommend a long soak in our whirlpool or sauna, a few laps in our indoor pool, or a quick workout in our state-of-the-art Ultimate Fitness Center. Square feet: 10351 sq. ft.
Largest room: 5438 sq. ft.